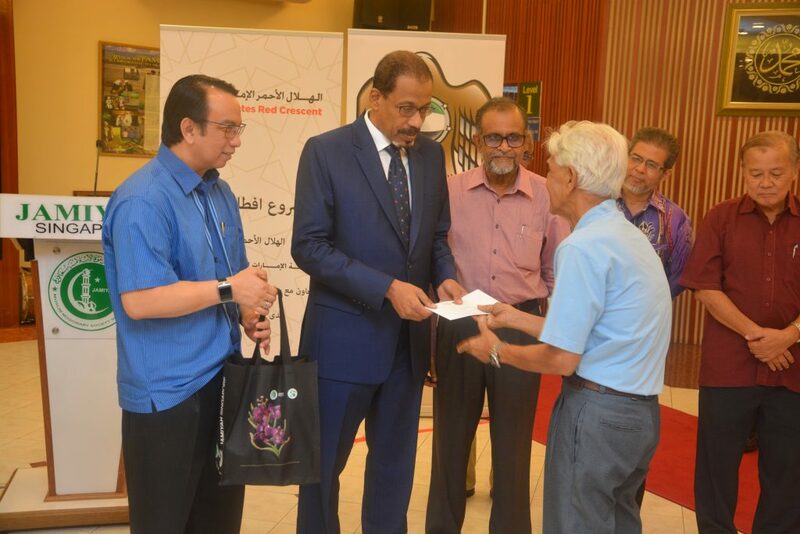 75 welfare beneficiaries of Jamiyah Singapore received ‘zakat fitrah’ from H.E Ambassador Dr Mohamed Omar A. Balfaqeeh, Ambassador of the Embassy of the United Arab Emirates to Singapore earlier today at the joint programme by the Embassy of United Arab Emirates and Jamiyah Singapore, 14th June 2017. Held at Jamiyah Headquarters, the Al-Malik Faisal Hall, the occasion is in conjunction with the holy month of Ramadhan where Muslims are also encouraged to give charity to those in need. “Ramadan is a season of goodness and mercy, the month of purity and charity, the month of cleanliness in which the hearts are cleansed and the souls rise high. It is the month of goodness, giving, dutifulness and abundance of good. It is the month of munificence, generosity, and spending in the cause of Allah,” said Prof (Adj) Dr Mohd Hasbi Abu Bakar, President of Jamiyah Singapore in his welcome address. The beneficiaries were called out individually to receive the gift from the Ambassador himself. In addition to that, the beneficiaries were also given a food ration hamper and porridge meant for break fast. Jamiyah Singapore would like to thank H.E Ambassador Dr Mohamed Omar A. Balfaqeeh for keeping Jamiyah and its beneficiaries in mind. May Allah SWT continue to bless His grace and compassion upon His Excellency and his loved ones, Amin.